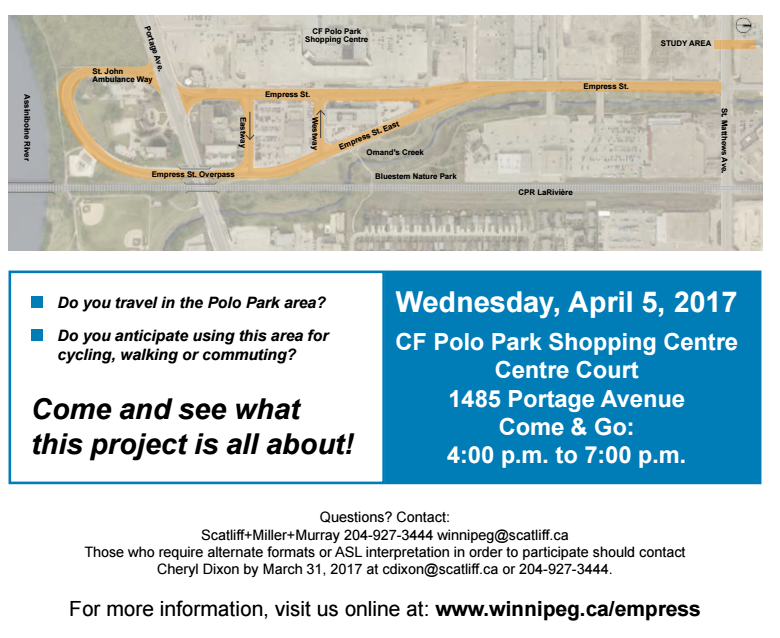 Do you travel in the Polo Park area? Do you anticipate using this area for cycling, walking or commuting? We want to talk to you! The City of Winnipeg has launched the Empress Street and Overpass Reconstruction and Rehabilitation Study. The study will plan for complete roadway and overpass improvements, while also taking an opportunity to create new, and improve existing cycling and pedestrian facilities in the study area. You are invited to come and see what this project is all about and view the preliminary design for this project. Come & Go: 4:00 p.m. to 7:00 p.m.
Those who require alternate formats or ASL interpretation in order to participate should contact me by March 31, 2017at cdixon[a]scatliff.ca or 204-927-3444.